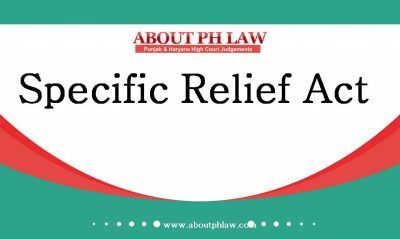 Comments Off on Specific Relief Act, 1963, S.34–Suit for Partition-Oral partition without causing entry in the revenue record or the records of the revenue authority would not confer joint ownership. Specific Relief Act, 1963, S.20~Agreement to Sell-Specific Performance-If the owner is having imperfect title and enters into the contract, on getting clear title, he is bound to execute and honour the agreement—Transfer of Property Act, 1881, S.43. Comments Off on Specific Relief Act, 1963, S.20~Agreement to Sell-Specific Performance-If the owner is having imperfect title and enters into the contract, on getting clear title, he is bound to execute and honour the agreement—Transfer of Property Act, 1881, S.43. Specific Relief Act, 1963, S.34–Suit for Partition-Co- sharer–Any construction made by a co-owner exclusively would not confer right in the entire property—A co-owner would remain a co-owner and, the Courts rightly passed a preliminary decree for partition. Comments Off on Specific Relief Act, 1963, S.34–Suit for Partition-Co- sharer–Any construction made by a co-owner exclusively would not confer right in the entire property—A co-owner would remain a co-owner and, the Courts rightly passed a preliminary decree for partition. Specific Relief Act, 1963, S.34–Suit for Declaration—Claim for Possession- -If a plaintiff has been in possession of the suit property then a suit for mere declaration would be maintainable—The corollary whereof is that if the plaintiff is not in possession, a suit for mere declaration would not be maintainable. Comments Off on Specific Relief Act, 1963, S.34–Suit for Declaration—Claim for Possession- -If a plaintiff has been in possession of the suit property then a suit for mere declaration would be maintainable—The corollary whereof is that if the plaintiff is not in possession, a suit for mere declaration would not be maintainable. Suit for Recovery-Shortage of gunny bags given by FCI– Appellant was incharge for purchase of wheat—One ‘G’ was also posted as additional incharge of said centre-Since appellant was not solely responsible for the shortage therefore ‘G’ ought to have been impleaded as co-defendant— Decree modified partially by reducing the amount to half liability. Comments Off on Suit for Recovery-Shortage of gunny bags given by FCI– Appellant was incharge for purchase of wheat—One ‘G’ was also posted as additional incharge of said centre-Since appellant was not solely responsible for the shortage therefore ‘G’ ought to have been impleaded as co-defendant— Decree modified partially by reducing the amount to half liability. Agreement to Sell—Cancellation of—Unilateral cancellation of agreement to self by one party cannot be raised as a in a suit for specific performance. Comments Off on Agreement to Sell—Cancellation of—Unilateral cancellation of agreement to self by one party cannot be raised as a in a suit for specific performance. Court Fee—Suit not to be rejected on ground of non-payment of fee. Comments Off on Court Fee—Suit not to be rejected on ground of non-payment of fee.